Recent work  indicates that the leak conductance (G L ) in the squid giant axon is optimal for the action potential firing frequency. Assuming a chloride leak current, the measured G L of approximately 0.3 mS/cm2 is very close to the theoretical optimal value that minimizes the absolute refractory period, or equivalently, that maximizes the highest frequency at which action potentials can be generated. These results were obtained by simulating brief, sharp current injections at one end of a Hodgkin-Huxley axon model, consistent with the standard experimental technique for measuring refractory periods. However, it is known  that constant current inputs to one end of a spatially axon can also evoke repetitive firing over a relatively narrow range of input strength. We have therefore investigated the optimality of G L for constant input currents (I DC ). We find that the repetitive firing frequency is indeed maximized near biological values of G L for lower values of I DC (Figure 1). 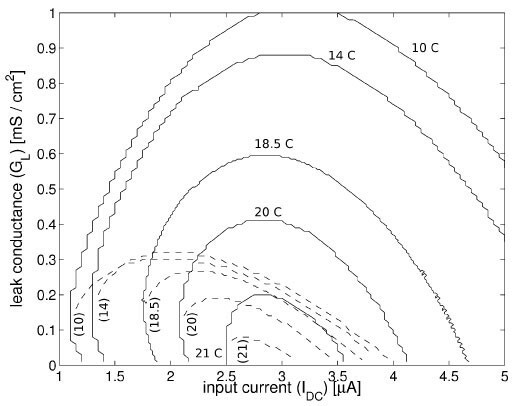 However, at higher values of I DC , the frequency-optimal G L goes to 0, and the firing frequency itself is even higher. Thus, solely from the point of view of maximizing repetitive firing frequency under constant current input, the combination of a high input current strength and little to no leak conductance would seem best. However, when one takes temperature into account, it suggests why evolution has not chosen this strategy. The ocean temperatures which a cold-blooded squid encounters can vary by as much as 10 degrees Celsius over a few months . The repetitive firing of the axon therefore must be able to function over such a range. As shown in Figure 2, the range of G L -I DC parameter space over which repetitive firing can occur shrinks dramatically with increasing temperature. Since the value of G L is presumably unchangeable, the configuration which best preserves the ability of the axon to repetitively fire over the largest range of temperature favors G L values near the biological value. 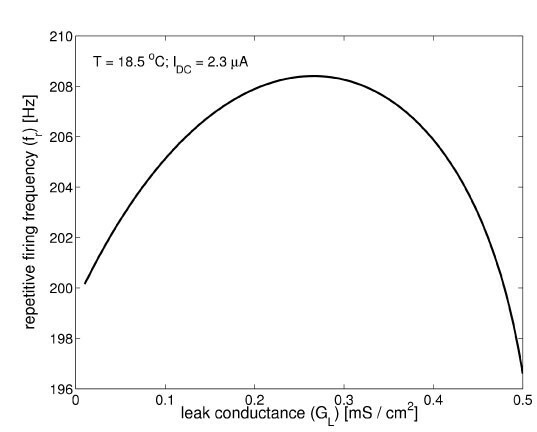 Repetitive firing frequency as function of leak conductance for a specific input current strength.